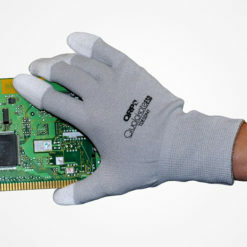 RiVAL CR are new chemical resistant, accelerator free gloves designed for various cleanroom and lab applications. They are bagged (not boxed) which is an important attribute that distinguishes them from a standard medical exam glove. Similar to the RiVAL Medical Exam Grade Glove, RiVAL CR offer ample resistance against a wide range of chemicals. See Product Info Sheet for more information. They are ideal for use in Class 100 (ISO 5) – Class 1000 (ISO 6) controlled environments and higher. Featuring beaded cuffs, and 12in length, every aspect of this glove was carefully designed to be every clean room workers favorite glove. TechNiGlove products are 100% nitrile, contain no natural rubber or silicone and meet the most stringent requirements for extractables and particles. Rival CR’s NEW soft modulus nitrile delivers the fit and feel of latex for the ultimate stretch and comfort. Microtextured fingertips provide and excellent grip on all surfaces.